Kenya tightened security at all airports and border crossings on Tuesday as authorities warned of a potential attack. (Members of a Somalian Islamist group, who call themselves the Islamic party, display their weapons during the arrival of Somalia's new president Sheikh Sharif Ahmed in Mogadishu Feb. 7. Mr. Ahmed has asked militant groups to lay down their arms. As Somalia's new president and prime minister vow to uphold peace, evidence is emerging of the international reach of Somalia's Al Qaeda-linked extremist groups. On Tuesday, officials in Kenya warned of an imminent attack by Somalia-based militants tied to Al Qaeda, reports The Standard, an English-language newspaper based in Kenya. They are reportedly unhappy with the cooperation between Kenya, the United States, and European countries in the war against piracy, a major source of revenue for terrorists and other criminal gangs in Somalia. Internal Security Minister George Saitoti said on Monday they are taking measures to ensure the attack does not occur. Saitoti also cited a US report by a spy agent, who warned that Kenya was likely to face terror attacks as extremists plot to hit US targets. Saitoti termed the remarks serious. Agence France-Presse adds that Kenyan authorities, on alert for possible attacks, tightened security at all airports and border points Tuesday. "We are screening all vehicles and persons entering the airport because we don't want to take any chances. We have instructions to be more careful. These threats are serious," said an official at the capital's Jomo Kenyatta International Airport. The heightened security underscores the continuing threat that militants pose to a new government struggling to bring order back to a country ravaged by 20 years of war, reports Xinhua, the official Chinese news agency. On Saturday [the] Somali parliament overwhelmingly approved the nomination of Omar Abdirashid Shermarke as ... Prime Minister after he was picked on Friday by the Somali president, Sheikh Sharif Sheikh Ahmed, who was himself elected in a parliamentary vote in the neighboring Djibouti last month. The hardline Islamist insurgent movements of Al Shabab and the newly formed Hezbul Islam vowed to fight the new Somali leadership. In an interview yesterday with The Wall Street Journal, the new president asked militant groups to lay down their arms. Mr. Ahmed said Monday that neither he nor his government had communicated directly with Al Shabab. Instead, he said he had made a public appeal to all groups to lay down their arms and participate in rebuilding the country. "If they agree to a dialogue, they are in, whatever their past positions were," he said, speaking through a translator during the interview. "If they are against dialogue, there is no way we can deal with them, except to be harsh." As the government struggles to maintain order inside the country, further evidence has emerged suggesting the global reach of militants trained in Somalia, reports the The Times (of London). "Pakistan rightly gets the most attention in terms of external threats," a senior counter-terrorism source said. "But we believe we should focus more on the Horn of Africa and Somalia in particular." The militant migration works both ways, with British citizens traveling to Somalia to fight, reports Britain's Daily Telegraph. Jonathan Evans ... voiced his concerns over increasing numbers of young men travelling to the East African country in an interview with the Daily Telegraph last month. He talked of "networks that help individuals go and take part or provide support to extremist gangs in Somalia" and may return to attack Britain. Michael Hayden, the outgoing head of the CIA, has said that the Ethiopian invasion of Somalia has "catalyzed" expatriates around the world. An audio message from Osama bin Laden last month urged Muslims to send money or go to Somalia to fight. 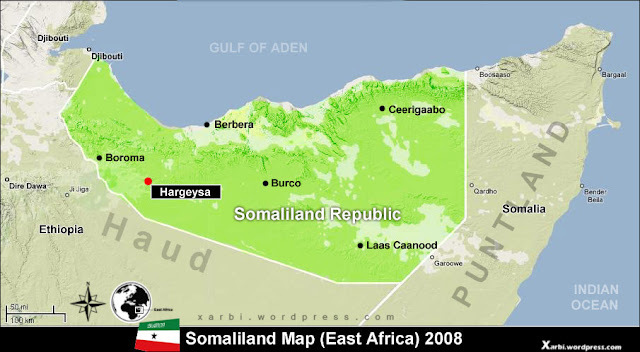 A recent report in Foreign Policy magazine draws attention to how the threat from Somalia is spreading. The mayhem is now spilling across Somalia's borders, stirring up tensions and violence in Kenya, Ethiopia, and Eritrea, not to mention Somalia's pirate-infested seas. The export of trouble may just be beginning. 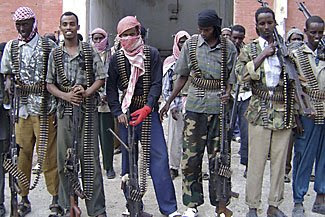 Islamist insurgents with Al Qaeda connections are sweeping across the country, turning Somalia into an Afghanistan-like magnet for militant Islam and drawing in hard-core fighters from around the world. These men will eventually go home (if they survive) and spread the killer ethos. Somalia's transitional government, a UN-santioned creation that was deathly ill from the moment it was born four years ago, is about to flatline, perhaps spawning yet another doomed international rescue mission.